This is one of the beautiful apartments located in Via del Babuino, connecting Spanish steps with Piazza del Popolo: the most famous area of the historical centre of Rome,rich in every kind of stores (high fashion, art galleries, restaurants, jewelleries). A strategic location to have all the most beatiful areas of Rome at your fingertips, including the prestigious music institute, the Academy of St. Cecilia. Located just between the metro stations of Piazza di Spagna and Flaminio, taxi ranks and bus stops, it is the ideal place to start your walks around Rome. The apartment is 60 sq. m. and is located on 4th floor without elevator and can comfortably sleep up to 4 people. It comprises: an entrance/lounge with a beautiful table furnishing it; an adjacent living room with Tv, comfortable sofa turning into two single beds; a bedroom with a double bed which gives access to the bathroom with shower. 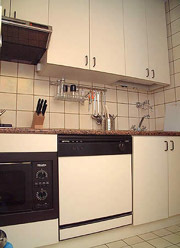 The kitchen is fully equipped with fridge, owen, dishwasher, microwave oven. A beautiful balcony with a view on Via del Babuino, the obelisk of Piazza del Popolo and the breathtaking spire of the Anglican church. Independent heating.